Dog City, which offers cage-free day care, walking, overnight boarding, spa and grooming and veterinary services, is found in a number of buildings in NYC, including Manhattan View at MiMA, and 70 Vestry. Love your dog more than life itself, but feel terrible that he or she is cooped up all day long in your teeny-tiny New York City apartment? You may want to move to a building that's close to a park and has dog washing stations, or has its own doggie daycare and other services. In this week’s Buy Curious, Sarah Riegle of Citi Habitats and Leisa Aras of Keller Williams Tribeca tell you which New York City buildings have amenities that can make your canine kid feel like a king. I consider my dogs to be my children, and want to give them the best. We’re in the market for a new apartment. 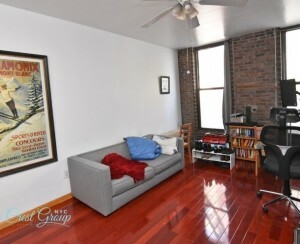 What are some of the best buildings in NYC if you have dogs? And how do I find them? Aras is a dog owner herself, so she fully understands the importance of finding a place that’ll be comfortable for you, as well as your pups. She has this crucial tip for apartment hunting for dog owners: “Just because a building lists itself as ‘pet-friendly’ doesn’t always mean it includes all pets,” she explains. She recommends being upfront and simply asking about a building’s pet policy before even considering heading to an open house. “There’s no use finding your dream apartment only to find out they won’t welcome your dog,” she says. 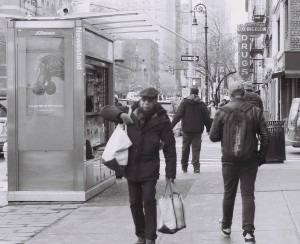 What amenities should you look for? Riegle says that pet-friendly amenities used to only be found in new construction buildings in Manhattan, but that developers in Brooklyn and Long Island City have also been integrating them into their designs over the past few years. “New Yorkers have become more vocal about their pets being part of the family—and builders are listening,” she says. She advises looking for pet-specific amenities like doggie day care, dog runs, in-building training, and veterinary services, as well as (the more common) pet spas and wash stations. 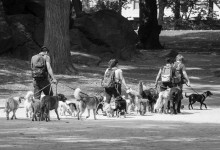 Aras adds that buyers should also look for locations close to public dog runs and off-leash spaces so their pooches can get the exercise they need. Private outdoor space for a pooch to have a place to play is the number one request made by dog parents. And many people—especially those with larger breeds—like having a walk-in shower to make it easier to wash up after a long, hard day. What buildings should you look at? 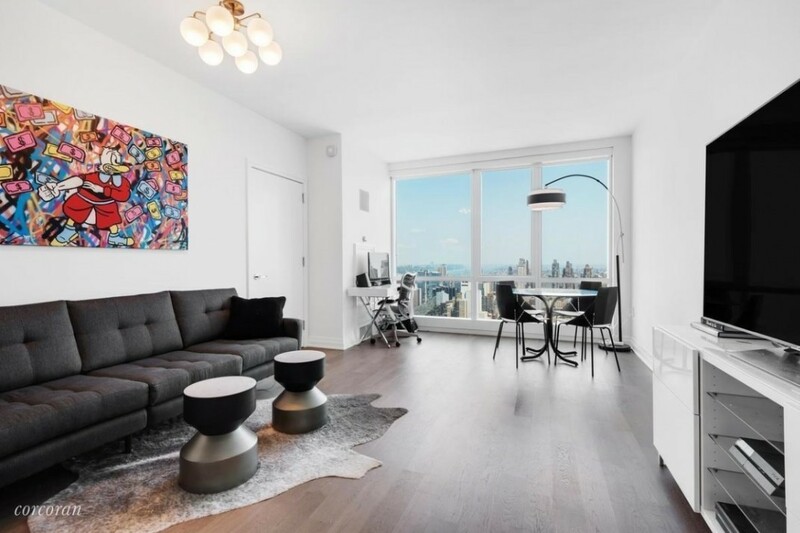 “50 West in Lower Manhattan made sure to consider furry family members in their plans,” says Aras, noting that it has a 200-square-foot designated pet area and a relationship with a vet and groomer, who will make house calls. Dog City, which offers cage-free day care, walking, overnight boarding, grooming, training, and veterinary services, is found in a number of buildings in NYC, including Manhattan View at MiMA in Clinton, and 70 Vestry in Tribeca. 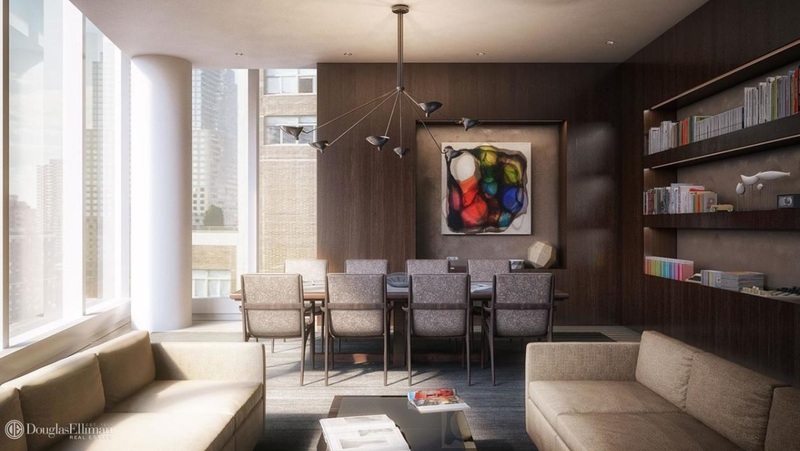 Sutton Place’s 252 East 57th St. has Spot 57, a dog play space and grooming bar. Dog walking and daycare services are also available. At 51 Jay St., a condo building built in a converted factory in DUMBO, puppies returning from playing in nearby Brooklyn Bridge Park can rinse off in a stainless steel tub at a pet washing and grooming station on the basement amenities level before heading to the elevators. 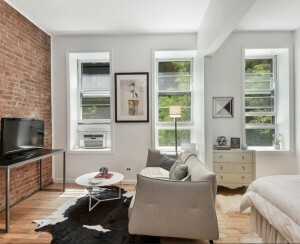 Pet-washing stations/rooms are also found at Pierhouse at Brooklyn Bridge Park in Brooklyn Heights, The Hendrik in Boerum Hill, 360 Central Park West on the Upper West Side, and Midtown’s One57. Do pet owners pay extra for amenities? “Very pet-centric amenities such as day care or grooming services typically come at an additional charge to pet owners,” Riegle says. Pet wash stations and dog runs, however, are usually considered part of standard amenities packages and do not incur any additional charges. Pros and cons of living in dog-friendly buildings? As for cons, a big concern for our experts is the potential for an all-out doggy brawl. Aras adds that when four-legged friends rule the roost, elevator usage can sometimes be complicated. “We have a couple of dogs in our building who are territorial and don’t like sharing the elevator, so you have to wait for the next one,” she says. Finally, there’s the fact that some people won’t ever want to share a building with dogs due to such varied reasons as allergies, fears, or simply a general dislike of dogs. So make sure you’re on the same page as any potential roommates/romantic partners with regards to living among the canine cuties of the world before embarking on an apartment search. Priced at $1,725,000, this 608-square-foot, one-bedroom, one-bath condo has oak flooring, 12-foot floor-to-ceiling windows, an open kitchen with white lacquer cabinetry and waterfall-edge marble countertops, a washer and dryer, and smart-home technology that lets you control the sound and temperature. Building amenities include an Equinox fitness center with a lap pool and basketball court, a golf simulator, screening rooms, and a computer room equipped with iMacs. 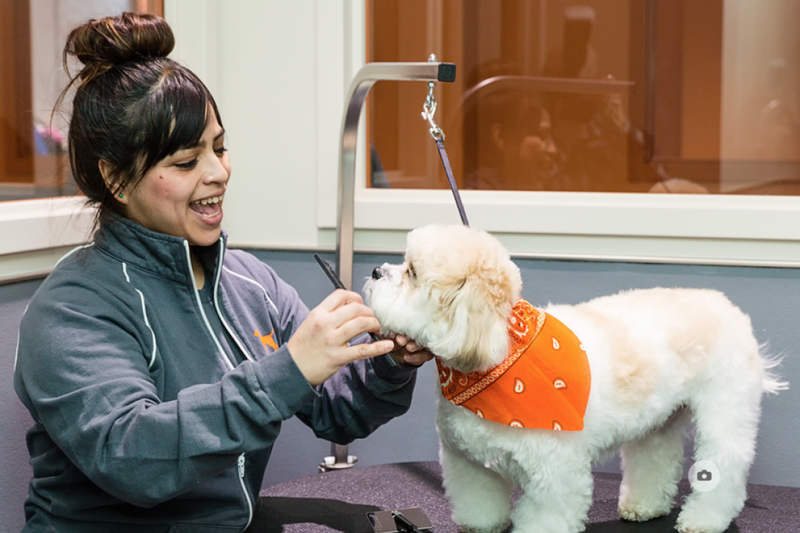 Dog City, a residents-only pet spa offers grooming, in-home feeding, and walking services. Common charges are $833 a month. 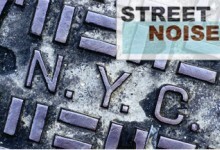 Taxes are $33 a month thanks to a 421-a tax abatement. 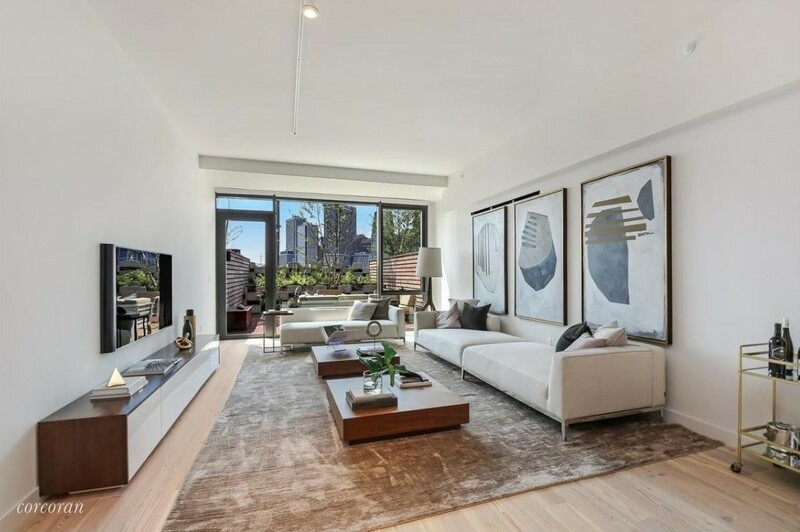 This 4,731-square-foot, five-bedroom, four-bath condo has private outdoor space, custom walnut cabinets and marble slab counters in the kitchen, reclaimed heartwood pine floors, and energy-efficient solar shades in every room. Building amenities include an attended lobby, valet parking, fitness center, meditation studio, event space, pet-washing station, refrigerated storage, play room, bike storage, and garage with an electric car charging station. Common charges are $4,744 a month. Taxes are $5,108 a month. 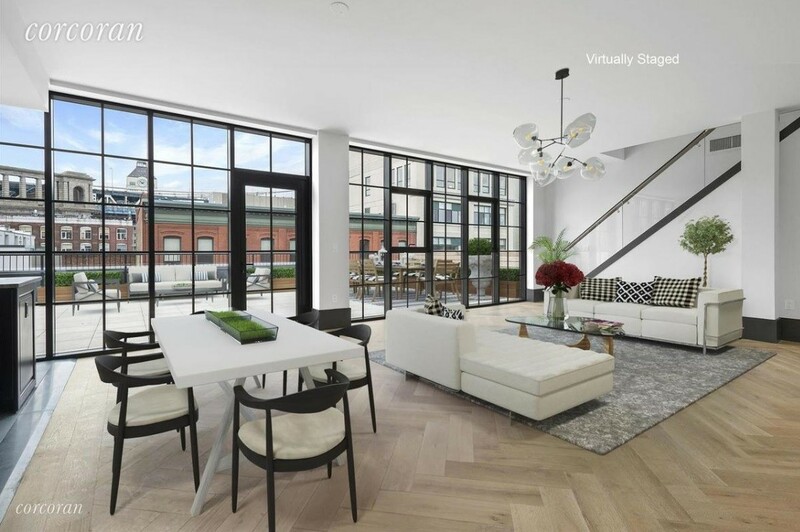 Listed for $4,995,000, this three-bedroom, four-bath duplex penthouse has a twol private terraces, casement windows, oak herringbone flooring, chef’s kitchen with marble slab countertops and a wine fridge, family room and a washer/dryer. A garage parking spot is included with the sale. Building amenities include a 24-hour doorman and concierge, gym, yoga room, playroom, residents’ lounge, rooftop terrace with grilling stations, landscaped central courtyard, and a pet washing and grooming station. Common charges are $2,275 a month. Taxes are $1,665 a month. 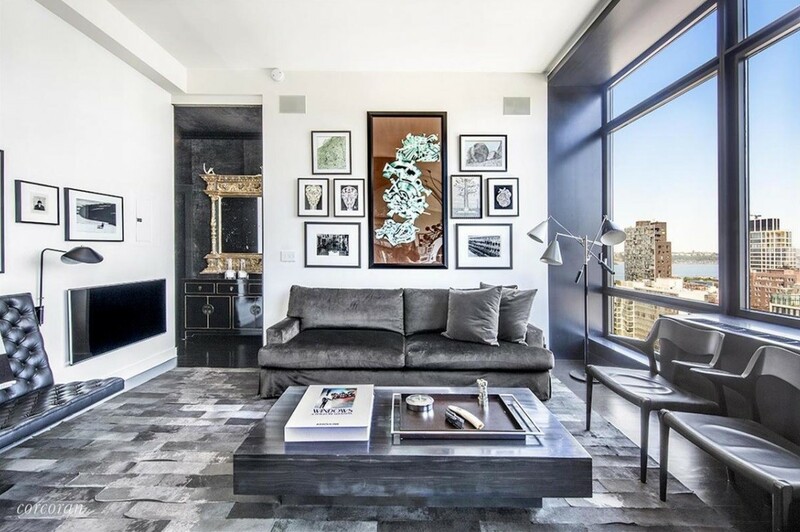 Features of this $2,200,000, one-bedroom, one-bath condo include a chef’s kitchen, foyer walls and crown moldings covered in charcoal velvet, baseboards and doorframes ensconced in black leather, an in-unit washer and dryer, and built-in storage in the bedroom. It’s in The Caledonia, which has a 24-hour doorman and concierge, an Equinox gym (that requires a separate membership), a parking garage (with a separate monthly fee), a rooftop terrace, a business center, a residents’ lounge, a pet spa, and a 421-a tax abatement in place through June 2021. Common charges are $833 a month. Taxes are $719 a month. 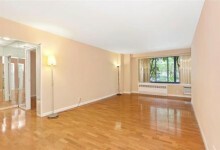 Listed for $3,395,000, this one-bedroom, two-bath condo has floor-to-ceiling windows, an open living room/kitchen area, lots of closets, radiant-heated floors in the bathrooms, an in-unit washer and dryer, and a walk-in closet that can be converted to an office or second bedroom. It’s in 50 West, which has a fitness center, lots of children’s amenities, a designated pet area, and a relationship with a vet and groomer, who’ll make house calls. Common charges are $1,558 a month. Taxes are $1,850 a month.